Tell us what it’s like to perform on stage with your very own mother (Asha Jain). It’s really fantastic. Firstly, it’s great to get to spend this much time with her. I am so busy so I don’t often get to do that. Secondly, I love watching the audience react to her- she often will get more laughs than me! I like it because it is a real testament to my mother’s personality- she is warm, welcoming and likes to meet new people. Many artists have certain routines or customs they perform before an important event or performance. Are there any sorts of rituals you engage in before you head on stage? Normally when I do a show, I will spend a while doing a warm up (stretching, practicing my lines). For this show, it’s quite relaxed. My Mom and I chat about our days, tell jokes and get ready to have people over. A Brimful of Asha is based on a true story. Are there any parts of the play where it doesn’t really require much ‘acting’ on your part, but just you being yourself? Anytime you tell a story you are acting things out – you play characters; you show how you behaved in a situation. This show is a lot like that. I play a lot of the characters that populate the story – only to give people a sense of what is happening. The unique thing about the show is that my Mom will often make new things up in the moment, so, we will improvise a lot. In that sense, it really is the two of us at the kitchen table. Among many of your talents, you’re a writer, performer and director just to name a few. Do you prefer one over the other? Why? I like directing more and more. I recently won an award for it, and I think I like doing that… but when I do this show it reminds me that I love performing. The major difference is the amount of energy required to perform each night. I’m getting lazier and like directing cause it’s more relaxed. What are your views on marriage? Is it something you’d like to embark on in the future? I am totally fine for getting married! If that is what someone wants to do, they should. I of course do want to – for me, I just want to do it in my own time. 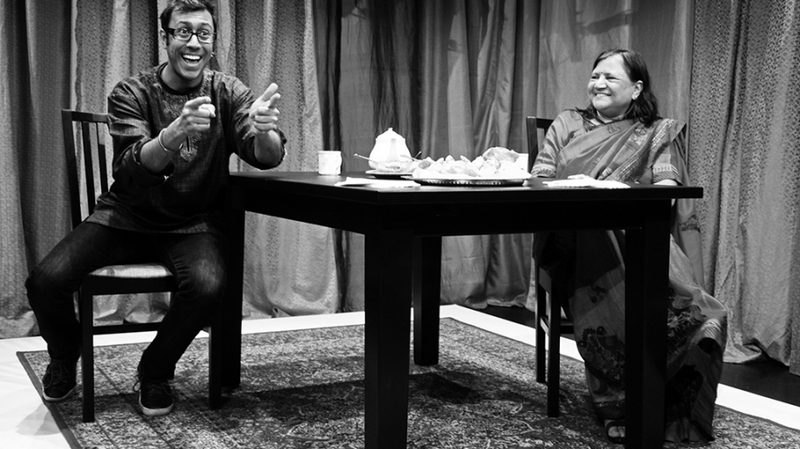 Running from Tuesday 23rd – Saturday 27th May we invite you to take a seat at the dining table with real-life Mother and Son, Ravi and Asha Jain in this heart-warming show, A Brimful of Asha. Book your tickets here.